Since clinton is running for president and is in danger of losing the New Hampshire primary by a wide margin, former secretary of state madeleine albright suggested that women who vote for Bernie Sanders are buying a one-way ticket to “a special place in Hell." At least Granite State women still have a chance to save their eternal souls by changing their minds by voting for Hillary. Here's another famous saying young women are thinking about; "Desperate times require desperate measures?" So she claims young women are incapable of making political decisions and choices because they want attention from boys??? That's the respect these hags have for women? According to them, young women are too stupid, to make a rational decision of their own? 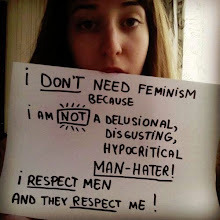 No wonder feminism is on a self-inflicted downfall, they have no respect for anyone, not even themselves. I don't think, in this day and age, women can't make a mature decision, and vote for the person that best represent their personal aspirations and beliefs. Maybe these young women are not following boys, maybe they're realizing, that owing 50 to 90 thousand dollars after college is just too much and has become an hindrance to proper education for all and it's not just for the elite and the rich. Which will stay expensive if clinton is elected. Education is the path to an evolving and prosperous nation, if countries smaller than North America can do it, why can't we? Maybe Bernie has a point? (in this case). It takes families out of poverty and gives everyone a chance instead of keeping them down. Or is it, that elitists like clinton, albright, steinem, and company want a substantial amount of poor people to provide them with a cheap labor force? Maybe young women also realized owing that much money for a useless women's studies course is just not worth it, and that voting for a feminist simply because of her gender is like going back in time when they where told to vote for a man simply because it was a man? You can tell when feminists are panicking, they treat people as if they are idiots. They are doing the same thing they claimed men use to do, shame women to vote, not according to their beliefs, but for a gender. Vote for clinton because she's a feminist and a woman, if you don't your following boys and your going to hell...? Really? Isn't this a basic disrespect for women's right to chose??? Or should "people" vote for policies and those who are best for them and those around them? Whoever that may be, such is true democracy and freedoms. Something feminists seem to have forgotten. We have been critical, as many others have, of the professional politician, (aka; the elitist), they will say anything for power, even make fools of themselves when thing do not work out and make ridiculous statements. Here is how to identify someone (an elitist) who want power instead of serving the public. 1- They will say anything to get a nomination. 2- Say something different during an election. 3- Do the opposite once power is achieved. Power should be in the hands of the people, not a chosen few. Don't get me wrong, we do respect freedom of choice; if this is what you want, so be it. What one has to remember is, who will it affect, will it help not only me but others in need, (poor, disabled, families, Elders, kids), are the policies beneficial to all, will it make my nation better or poorer, will it enhance quality of life? Democracy is not just a word, it's worse enemy is tribalism, voting for someone because of gender, race, or whatever, keeps us from evolving our nation, the more we vote for a group instead of policy, the slower we advance.